So, the wedding has been and gone and our honeymoon in Sri Lanka already seems like a lifetime ago… but I’m not quite ready to let go of these happy times just yet, so let me inflict upon you the blogging equivalent of the dreaded holiday photo slideshow (sorry!). Of course, I have to start with the wedding cake. Let me just say that I found wedding planning incredibly stressful all round, and at one point I was contemplating making my own wedding cake because I was getting quite frankly ridiculous quotes for something that would be demolished within an hour or two. Luckily, a good friend told me about a friend of hers who makes wonderful cakes for living, Lisa from Lily and Dilly. She was really easy to work with and managed to do exactly what we wanted for a reasonable price. Et voila! 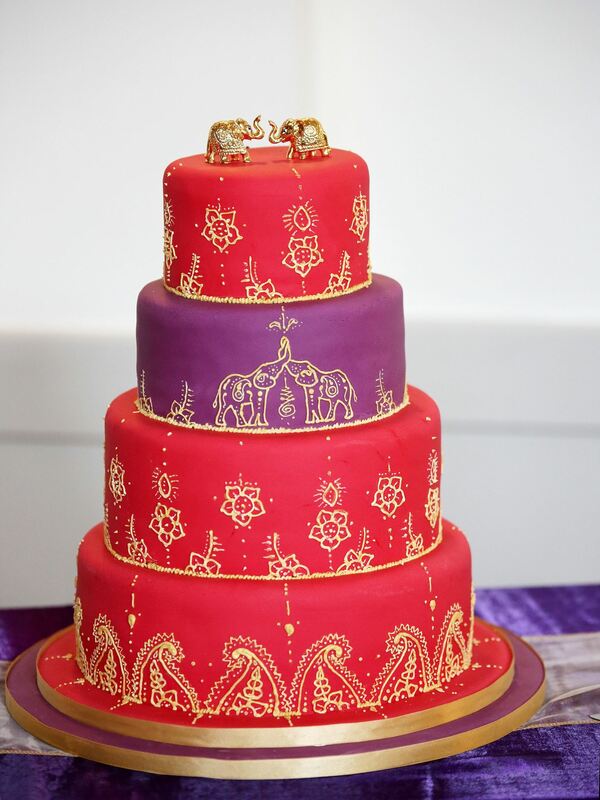 We knew that we wanted a red and purple cake to fit our colour scheme. We also wanted to incorporate elephants – another key part of the theme – but we weren’t quite sure how until we spoke to Lisa. She suggested copying the elephants and paisley pattern on our wedding invitations onto the side of the cake, and also helped us choose our flavours. Each tier was a different flavour – from top to bottom, they were traditional fruitcake, rose and pistachio, Victoria sponge, and mango and coconut, thus reflecting both of our cultures in one cake. I only tasted the Victoria sponge and mango and coconut layers on the day, but they were bloody lovely, and I’m looking forward to trying the fruitcake we have in the freezer on our one-year anniversary. The elephants on top came all the way from India with my cousin, and I think they made a rather nice finishing touch! All in all, we were delighted with the end result, and I’m pretty sure our guests loved it too! It was nice to have something different from your standard ivory wedding cake, and it was a big reflection of my own passion for baking (and the husband’s passion for eating cake!). It was a million times better than anything I could have done. Thank you Lily and Dilly! Our honeymoon was bloody amazing. It was the best holiday we’ve ever been on, and I want to go back! We went on a chauffeured tour (organised by Audley Travel) of mainly the central part of the island, taking in major sights like Sigiriya, the Dambulla cave temples and two national parks, where we saw lots and lots of wild elephants. One of the main highlights was definitely the food. We’ve had Sri Lankan food before, and have a cookbook that we’ve made a few things from, but it was so wonderful eating the real thing! Sri Lankan cooking is dominated by coconut, chillies and aromatic spices like cardamom and cinnamon, as well as by the abundance of fresh fruit and vegetables grown on the island. We certainly got our five a day and then some! A home-cooked Sri Lankan lunch! Rice, green mango and coconut curry, cucumber curry, okra, pumpkin curry, jackfruit (which looks scarily like meat), coconut and chilli chutney, water spinach, and poppadoms. I also had fish with mine. And there was a sort of flat bread. We had to eat it with our fingers. It was DIVINE. The lady showed us how to cook the mango curry so @sundara_jivitaya is going to make that for me when we get back! A proper Sri Lankan breakfast! I had string hoppers (rice flour noodles) with potato curry, lentils and spicy coconut chutney. The other thing that dominates Sri Lankan cooking is rice. It seems that the traditional Sri Lankan meal is a big pile of rice with anything from 3 to 10 curries (we even saw ’17 curries’ listed on a menu once! ), as well as salads, pickles, chutneys and so on. Whenever we had this for lunch it only seemed to cost us around £3 or £4 each. Bargain! Last night Sri Lankan feast. Something I had earlier in Dambulla: honey and yogurt cake, which was essentially a Sri Lankan cheesecake. Nom! Sri Lankan desserts! Wattallapam (coconut milk, jaggery and vegetable oil) and passion fruit cheesecake. Phwoar. Tonight’s desserts: mango, marmalade cake and a “creamy glass”, according to the buffet card. More Sri Lankan desserts! On the bottom row is kalu dodol, wattalapam and an incredible banana cake flavoured with cumin seeds. There are dozens of banana varieties in Sri Lanka, not just the one we have in the UK, and they range from sour to sweet. In terms of traditional Sri Lankan recipes, jaggery featured a lot – wattalapam (watalapam? Unsure of the exact spelling!) cropped up a few times, while kalu dodol was very similar. The other traditional sweet treat that we kept seeing and which I tried once was curd and treacle – a rich buffalo milk curd (similar to yogurt but not as acidic) topped with a runny treacle that is related to jaggery. It was delicious! My amazing dessert: coconut and jaggery panacotta with a burnt coconut and jaggery crisp. Phwoar. Just received a special delivery! Dessert post on behalf of @mooingzelda as she didn’t have her phone with her at the dinner table. Coconut and honey pancakes. Fresh fruit was probably the king of desserts (and also of breakfast – Sri Lankans seem very keen on a fruit platter first thing in the morning) – bananas, coconuts, pineapples, passion fruit, guava, papaya and, most excitingly, in-season mangoes were everywhere, from the hotel buffets and menus to the market stalls we kept passing as we travelled from place to place. Everything else seemed more western-inspired, and I sadly didn’t see any love cake (which I’d read about a lot beforehand), but I do have a recipe for it in our Sri Lankan cookbook, so I’ll have to give it a go one of these days. I also suspect that I’m going to try to replicate the banana and cumin cake pictured above – it was such as unusual combination but so delicious! I could go on and also describe the delicious cocktails we had, but I’ll leave it there for now. It’ll be business as usual from next week – I actually only just this minute finished baking my first cake since we got back (I’ve been too jet lagged and ill to do it any sooner!) so you’ll be able to read all about it next week. PS I did the Great Manchester Run as mentioned last time, and managed to beat my target time by two minutes to run it in 1 hour and 13 minutes, despite the aforementioned jet lag! I raised an amazing £215 for the British Red Cross and donations are still welcome! I’ve been on quite the ginger kick recently, haven’t I?! 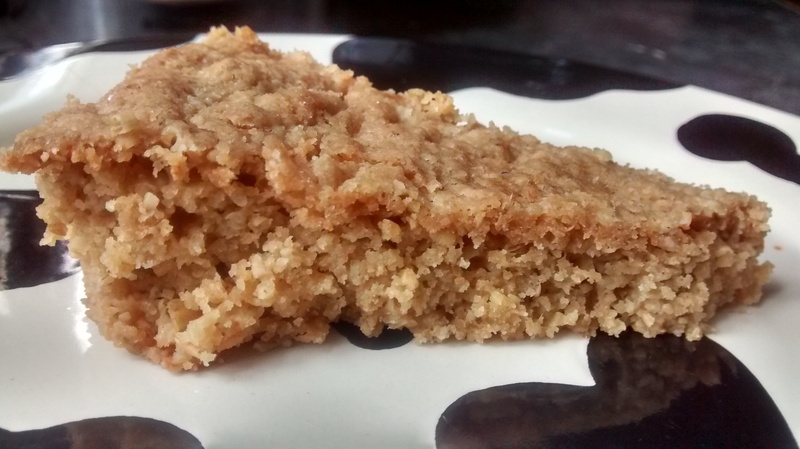 I decided to follow the ginger and coconut flapjacks I made last time with this Grasmere ginger shortbread, completely forgetting that I’d already made something gingery that week… oh well. The recipe for this comes from good ol’ Delia, who says she got the recipe from a hotel in the Lake District. I’ve been intrigued by this recipe since I first saw it in the recipe book, because I’m a huge fan of the Grasmere gingerbread that’s sold in the village of the same name – it’s just the BEST gingerbread you’ll ever have. The recipe is supposed to be a closely held secret (and quite rightly so), so I was interested to see what this version was like – and, as it turns, out, it’s really not the same thing at all! Don’t get me wrong, Delia’s shortbread is delicious, but it’s nothing like the real thing. Grasmere gingerbread is a bit more chewy and infinitely more gingery than Delia’s take, and the oatmeal is very noticeable here – if it’s used in the original Grasmere gingerbread recipe, I’ve never been able to tell. 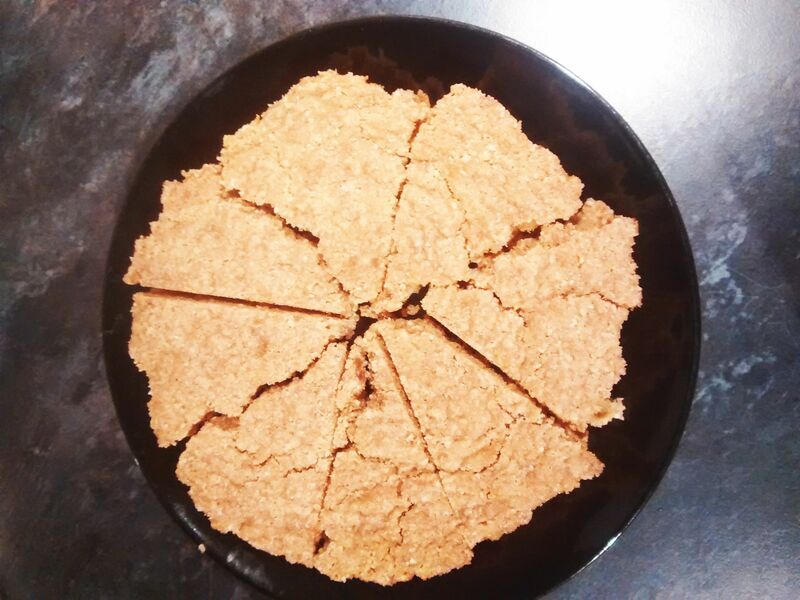 As you can see from the first photo above, I ended up with some rustic-looking shortbread – the ragged edges are due to the outside of the bake breaking away when I tried to release it from the tin. I think the shortbread needs to cool for a lot longer than 5 minutes before you try to turn it out! Nevertheless, Delia’s Grasmere ginger shortbread is really nice – it’s just a touch disappointing if you’ve ever stood on top of a hill in the Lakes, drinking in the amazing views while nibbling on some proper Grasmere gingerbread. Finally, just a note that you won’t hear from me for a bit, because I’m getting married next weekend! We’re off to Sri Lanka for our honeymoon, and I’m running the Great Manchester 10k for the Red Cross three days after we get back (you can sponsor me here if you like! ), so you probably won’t hear from me until closer to June. I will hopefully have lots of new, exotic baking ideas from our trip, though, so it’ll be worth the wait! See you on the other side!